AMD's outlook is even more optimistic. 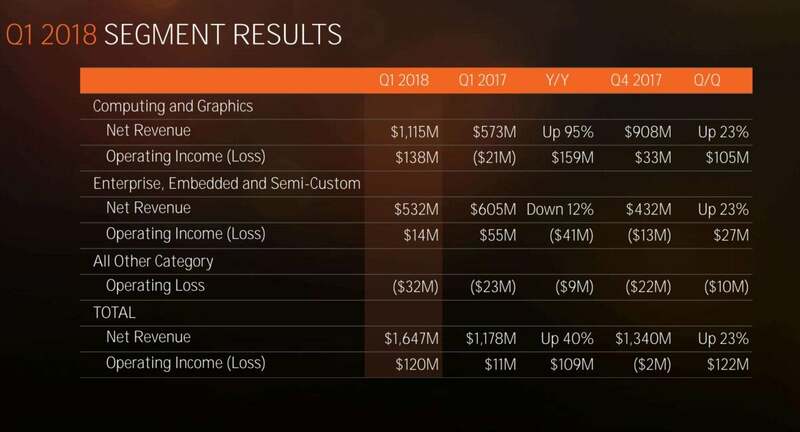 Revenues in AMD’s computing and graphics segment nearly doubled compared to a year ago, paving the way for even more growth as AMD’s mobile Ryzen chips begin taking the field. AMD, which has struggled to achieve profits for most of the last decade or so, reported a $114 million increase in net income to $81 million during the first calendar quarter of 2018. The company also posted a sizeable 40 percent increase in revenue to $1.65 billion. 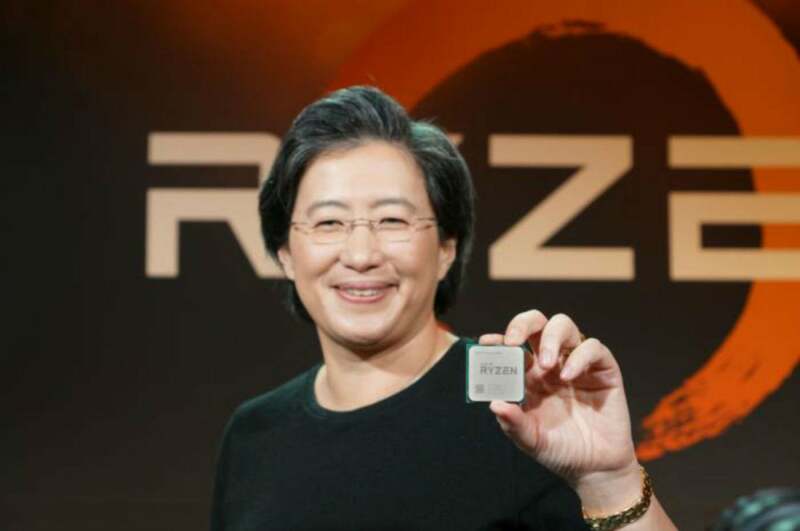 AMD even confidently predicted revenues for the next quarter would be about $1.725 billion, which would represent an increase of another 50 percent. AMD’s numbers represent the success of both the company’s Ryzen and Vega-based GPUs, while the outlook reflects expectations for the recently announced Ryzen 2 CPUs and notebook chips. Processor sales were “significantly better than seasonality,” chief executive Lisa Su told analysts in a Wednesday afternoon conference call. “We believe 2018 is shaping up to be an excellent year for AMD Ryzen, Radeon, and Epyc products,” Su added. What this means for you: Financial stability is a good thing for Intel’s chief rival. AMD watchers have quietly wondered for years whether the company would have the products or the resources to continue competing. Currently, it looks like AMD does, and the chip maker clearly aims to topple Intel from its lofty perch in the CPU world. AMD’s first-quarter 2018 results, by segment. AMD is essentially becoming a Ryzen-driven company. About 60 percent of all processor revenue is derived from sales of Ryzen products, Su said, and the prices of the average desktop chip increased—not surprisingly. Meanwhile, the Enterprise, Embedded and Semi-Custom business (AMD’s Epyc server processor, plus the GPUs it ships into all of the major game consoles) have fallen 12 percent to $532 million. Next, the attention is turning to mobile, a larger market than the desktop. AMD announced the Ryzen 7 2700U and the Ryzen 5 2500U mobile chips last October, for three PCs: the Lenovo IdeaPad 720S, Acer Swift 3 and HP Envy x360, without really saying when the laptops would launch. Su said some shipments of the Ryzen Mobile platform began this past quarter, but hardware partners were preparing for their big push during the current second quarter. Shipments of Ryzen Mobile chips into the commercial space is also expected to begin. Overall, AMD expects over 25 commercial and consumer notebooks using Ryzen will ship. AMD said less about how well its GPU business is doing, where it lags Nvidia. Intel hired Raja Koduri, AMD’s graphics chief, last November, after Koduri helped shepherd the Vega GPUs to market. A 7nm version of Vega will sample later this year, Su said. Devinder Kumar, the chief financial officer of AMD, reported that the company attributed 10 percent of its revenue to blockchain, evidence that the e-currency miners driving the prices of GPUs were still affecting sales. Though Su said the company maintains an open dialogue with both commercial miners and traditional retailers, the company’s commitment was clear: “Our first priority when we look at allocations is to gamers,” Su said, referring to which segment will get priority. Kumar also predicted that the percentage of blockchain revenue would drop during fiscal 2018, from the middle to to the high single digits.